A hybrid between contemporary and ancient technology, Random Access Memory composites algorithmic and material systems, a constant duality in computational technology, and finds some problems. The machine combines pure mathematical processes with impure material implementation, see how it follows rigorous algorithmic operations with this awkward, unpredictable material. Random Access Memory (2016) is a fully functional digital memory. Instead of operating on semiconducting components to represent either the binary states of 0 (zero) or 1 (one), the memory uses grains of sand as storage material. 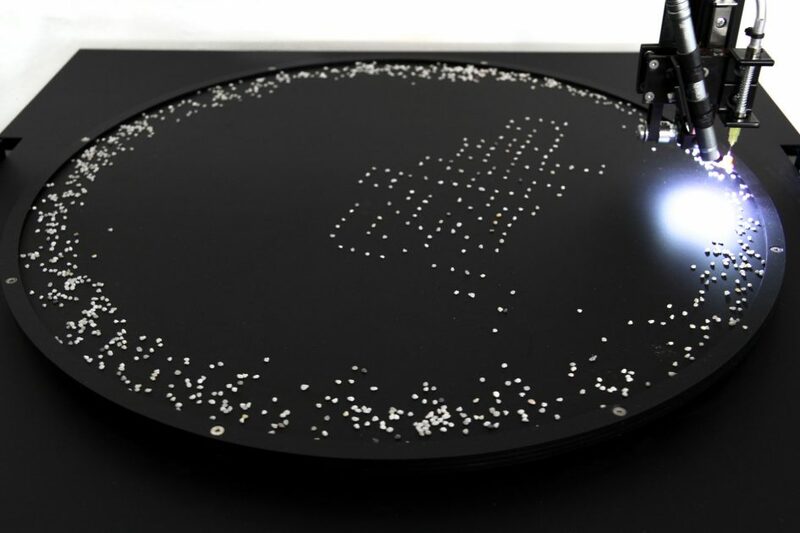 Sand grains can be read, placed or removed on a rotating disc by a three axis pick and place mechanism combined with a microscope camera to track the position of a single grain of sand. This memory mechanism is prone to errors through misreadings, bouncing grains and other imponderabilities. Furthermore the machine performs a computational process on this memory. The algorithm, executed on the sand grains, is a so called Turmite, a two dimensional operating Turing Machine. It’s only goal it is to write as many 1’s (stones) as possible in the memory and to avoid a termination, following a strict rule. This process emerges complex and repetitive pattern on the disc. Ralf Baecker (1977 Düseseldorf, Germany) is an artist working at the intersection of art, technology and science. Through installations and machines, Baecker explores fundamental mechanisms of action and effects of new media and technologies. In his representations and spatializations of microscopic processes he seeks to expand our perception. At the core of his objects lies the entanglement of the virtual with the actual, or rather, with the world. With a media-archaeological outlook, Ralf Baecker digs within obsolete devices for traces and functions that are still detectable in technologies today. His work seeks to form a hybrid between current digital aesthetics and an historical understanding of materials. As a result, he understands technology not as a tool but rather as an epistemological instrument, in order to pose elemental questions about a world perceived through technological impressions.